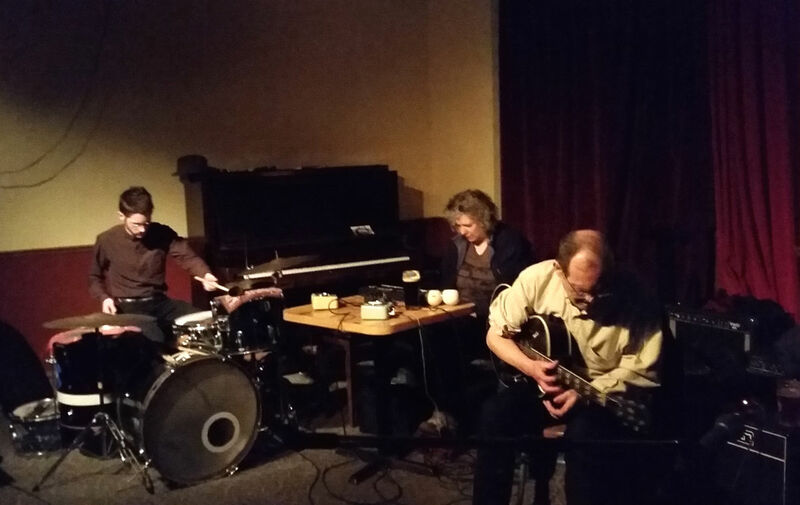 Recorded at The Tranzac (Southern Cross Lounge), March 27, 2016. There was a goodly handful of folks out to chill with this on Easter Sunday, though the Annex streets, far from chill, offered an unholiday-y streetscape, including a crowd outside the Brunny. I keep forgetting that Easter isn't Easter like it used to be, with the city locked up tighter than a drum. (Of course, within a couple weeks, the Brunny wouldn't be the Brunny like it used to be either.) The occasion was a now-rare visit to the city from drummer D. Alex Meeks, giving him a chance to reunite with a couple of his formerly-frequent improvising partners. Kicking things off with Allison Cameron and Stephen Parkinson was a bit like putting on an old pair of shoes — immediately comfortable and ready to lope around in. As soon as that familiar watchmaker's ratapat drumbeat started ticking it was as if no time had passed since I last saw the group in action. It was also interesting to contrast Meeks' free-but-tightly-controlled style with the percussion work that Germaine Liu has been bringing to the group's reformulation. Recording: The Science of What?